Life is a bit hectic at the moment, so I hope you’ll excuse these meandering posts. Sometimes it’s tricky to find time for detailed writing, but I always have bits and pieces to share. About once a year, I render lard from free range pork fat. I know it sounds like we go through a lot of it in our cooking, but we really don’t use that much – it’s so concentrated that a little bit goes a long way. This time, I put the fat into the food processor to blitz it up first (far easier than chopping finely by hand), then cooked it very gently for several hours in a heavy pot with half a cup of water added. I’ve rediscovered an old word game called Bookworm – it’s now available on the iPad for a couple of dollars, and it’s very addictive. Do you play it? Crazy, Busy Week – need baked goods – comfort foods – YUM :) Happy Weekend! Traveling, tired and totally bizarre- this week has been full of tornado warnings and flooding rains. In fact we came home Monday evening to the tornado siren going off down the street and phone warnings to go straight down to the basement. Since then it has rained every day and my back yard is a swamp and a quagmire. But I did make some delicious sourdough rye bread that slices up beautifully and is perfect for sandwiches. Your week looks quite lovely- especially that plate of chocolate at the end! Your weeks sound so full of flavour, well done you (as usual). My week was also very busy. I flew up to Coffs Harbour to help my sister in her shop. She has an Asian grocery store with a side line of fresh flowers. I help her assemble the wrapped posies for Mother’s (and Valentine’s) Day each year. They are long days but so rewarding as everyone is happy with their posies. They are so colourful and fragrant. When it was my turn for kitchen duty I cooked a 1/2 leg of lamb; the side dish was a cheesy potato and cauliflower bake served with a big green side salad and a dish of baked, herbed mushrooms and a big jug of gravy. As usual I left the freezer packed with delicious servings for one for my husband (osso bucco, lentil curry, lamb this, beef that) but found the remains of a dead pizza and most of the cheese gone on toasted cheese sandwiches. LOL No matter I am home now and tonight we will feast on grilled tuna slices, baked tomatoes and a green salad. I think I know this shop. We buy flowers there (to take to the nearby cemetery?) and I love browsing the goodies, never leaving empty handed. Sandy, that sounds like a seriously fun week! Nice that you could enjoy such a great meal with your sister, and your husband doesn’t know what he missed (seriously, pizza instead of osso bucco? :)). I love your business, you never let the standard of food drop one iota! My grand daughter introduced me to Bookworm ages ago. I’m a words freak so it suits me hands down. I can finally say I’ve mastered the sourdough spelt challenge, this week we’ve had pizza and olive focaccia, bliss after 18 months without that crunchy but chewy mouthfeel. Sandra, how cool that the spelt is working well for you! I think I’d miss bread terribly if I couldn’t eat it! Crackling in bread? Be still my heart. If only I could eat bread I would be knocking at your door! Looks beautiful too, you are an amazing cook! Hectic indeed!! So many lovely things coming out of your kitchen, I love that Ibis. Loving the lard Celia, I have pots of duck fat in the fridge but must get onto some pork lard next. Those anchovies look good, but my special treat are truffled anchovies that Tania put me on to at Lario- delicious! Thanks hon, you too. Still warm up here – what’s the weather doing in Canberra? I have to get onto companion planting. I bet you always get asked to bring a plate if you take those delicious offerings when you are a guest! Lovely bread. Have to try it when I get cracklings again! I usually make dumplings from them. Your brownies look delicious. You’ve had a busy week. Manuela, I had no idea you could turn them into dumplings! Do you mean the doughy sort that goes on top of soup, or the Asian variety? 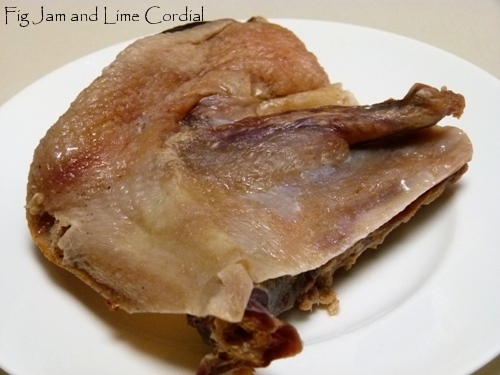 Love the lard rendering Celia – you are such an inspiration. You also have admirable restraint. Those crackling bits looked too delicious. I suspect I may have attacked them with a spoon. Tania, too addictive? :) I get free range pork fat, I think it’s usually from the belly. Proper old fashioned lard is usually made from leaf fat, which comes from around the kidneys, but it’s almost impossible to buy here. That is indeed a beautiful ibis and lots of lovely goodies in your kitchen. Just taking a few moments to catch up on your recent posts as I have very much missed reading your blog (hectic also lately for me!) and I’m so glad I did as your soothing shortbread will be perfect to make and take up to Scotland for my very ill MIL. Thank you, Celia! I did have a quick moment of lard envy, Celia. You’ve had a busy but wonderful week. Thanks darling, it was a good week. Sometimes it’s nice to document them, so that we can look back and see that how much fun it was. Your kitchen must permanently smell wonderful Celia. What a super busy week you have had. I would battle not eating those anchovies while decanting them. Have a wonderful and relaxing weekend. Mandy, a fellow anchovy lover! I’m hooked on them – these ones have heaps of flavour rather than just tasting salty! When do you get time to sleep Celia! Like Maureen, I have lard envy! Celia I always marvel at how you manage to create such wonderful looking treats from things other people wouldn’t dream of cooking with! You’re so clever! Claire, and you’re so kind, thank you! :) I just don’t like waste.. I have yet to render lard, though I do save my bacon grease from pastured hogs for various things. I would also like to render beef tallow, but until I get around to it, coconut oil will have to do for now. I do not play Bookworm, but I love playing word games. Lately it’s been Words with Friends, which is like scrabble and it’s friendly competition. Do play against yourself or others with Bookworm? What a week, Celia, you seem to do so much with your time. I don’t know how you do it but I certainly admire you for all your energy. I must admit though that crackling sweet bread sounds a little strange. Glenda, I thought so too, but the sweet dough really isn’t very sweet – it’s like a brioche, and it takes all sorts of savoury variations really well! You have had a busy week! I love your tins of anchovies. I’ve just recently gotten over my aversion to anchovies and have been using them quite a lot. A good roundup of the week that was. Seems like yours was really busy but rewarding at the same time. Plus, you got free garlic! Yey! There’s always something happening at your house Celia:).My week has been spent trying to catch up on uni work. Missed 3 weeks so l am behind with everything and it’s all due in the next 2 weeks. I like meanderings, a bit of this and a bit of that. White ibis are known as Macca birds in our house after a friend who detests them. The name has become so entrenched that I forgot that other people don’t call them that. Regular sourdough baking is back this week with 30% rye flour. It’s getting better each bake. I need a new word game on my Ultrabook. I hope they do Bookworm in the Google Store. We have been away so this week I’m grateful for the freezer stash and the local greengrocer. It surely sounds like you had a fun and tasty week. That crackling bread looks terrific and of course the brownies would tingle my taste buds. That’s quite a nice load of garlic. I never realized that you could just stick the ones that have sprouting in the garden. Do they multiply a lot?